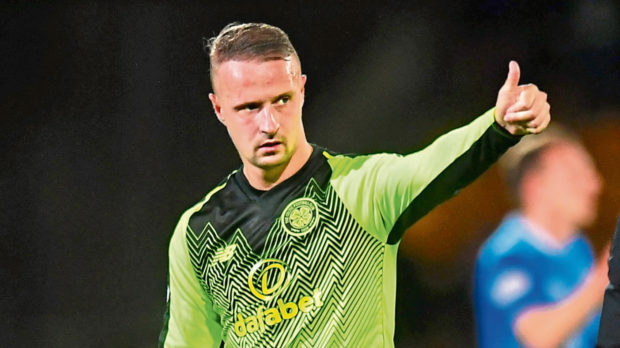 The Hoops granted hit-man Griff an indefinite period of leave to deal with personal, off-field issues in December. But after meeting with the striker last week, Lennon is hopeful it won’t be too much longer until he pulls on a Celtic jersey once again. “I met Leigh on Monday,” said the Bhoys boss. “I’m optimistic about seeing him back before the end of the season. “He looked OK, in reasonable condition. “But he’s got a bit of work to do to catch up with the rest. That’s what we’re hoping will happen over the coming weeks. “I don’t want to talk about private things, but he’s obviously itching to get back. “It’ll take a bit of time, but hopefully we’ll see him before the end of the season. “If we can get him fit and firing we’ve got a top-quality centre-forward. “It’s down to him now. Meanwhile, Lennon hailed former Celt Virgil van Dijk as the planet’s best defender after another dominant week from the Dutchman. “I agree that he is the best defender in the world. I don’t see anyone better than him,” said Lennon, who brought Van Dijk to Parkhead from Groningen in 2013. “I saw him at Old Trafford a couple of weeks ago and he dominated the game. He makes it look so easy, he does everything so cleanly. “Defensively, the other night he was excellent against Lewandowski, who isn’t bad, by the way, and then you see what he brings to you at attacking set-plays. “He’s up there with any of them over the years. You could compare him to Alan Hansen. “They are different types obviously because Virgil is a more physical specimen, but Hansen could read the game and was brilliant on the ball, playing in a good team. “Virgil has made Liverpool better, there is no question about that. “He’s playing every game the way we knew he could, and he has now gone up another level. He’s adjusted to it brilliantly. “He’s like a Rolls-Royce. I’m surprised no one took him earlier, and none of the bigger clubs than Southampton took him, but it was smart from them and now it’s smart from Liverpool. “He could play for Real Madrid, Barcelona, Juventus and it wouldn’t be a problem. The pressures are different, but he could adapt to that, no problem.